Prominent Republican defense hawks including Senate Armed Services Committee Chair John McCain of Arizona and House Armed Services Committee chief Mac Thornberry of Texas have loudly complained that President Trump’s proposed military buildup wasn’t nearly enough. McCain has called for a fiscal 2018 defense budget totaling $640 billion, or $91.3 billion above the legal spending cap, while Thornberry is clamoring for more than $700 billion. As House Budget Committee Republicans near agreement on a fiscal 2018 budget resolution after months of wrangling, McCain and Thornberry will get a portion – but far from all – of what they have demanded as part of a new spending blueprint. House Budget Committee Chair Diane Black (R-TN) and other senior Republicans have tentatively agreed to boost the Pentagon’s base budget to $621.5 billion next year – or $18.5 billion more than Trump requested, according to sources. The budget would also provide $75 billion for a separate Overseas Contingency Operations fund for military operations in Iraq and Afghanistan that would exceed the president’s request by $10 billion. The House Budget Committee is likely to put the finishing touches on a $1.1 trillion spending blueprint shortly after the July 4th recess, after postponing final action this week to resolve lingering difference over spending cuts to reduce the long-term deficit. For sure, the proposals are just the opening bid in what will be a highly contentious and protracted budget battle in the coming months, as House and Senate budget committee Republicans clash among themselves and with the White House and the Democrats over spending policies for the coming year. With little public debate so far, House Republicans are pressing to match the massive defense spending increases the deficit hawks are demanding with reductions in non-defense discretionary spending and much deeper cuts in mandatory spending programs, including Medicaid, food stamps, and welfare. "Chairman Black is 100 percent committed to getting a budget done,” said William Allison, the House Budget Committee’s communications director. “It's the strongest possible step to achieving real deficit reduction, strengthening our military, and beginning the tax reform process. The committee plans to keep this process moving after the July 4th recess." Although the Democrats are demanding parity in setting new defense and domestic program spending, the emerging fiscal 2018 budget would provide just $511 billion for domestic programs next year or $5 billion below the legal cap. Still, the new non-defense discretionary spending would be an increase when compared to the Trump administration's $462 billion budget request. The request for increased military spending is especially galling to some lawmakers who are well aware that the Defense Department has never passed an audit, has systematically falsified numbers to match Treasury outlays, and buried evidence of $125 billion in wasted taxpayer dollars. What’s more, House Republican leaders are seeking between $150 billion and $200 billion of further reductions in Medicaid, food stamp, welfare and other mandatory programs to help offset defense spending and reduce the deficit. Those cuts in Medicaid would come on top of the $800 billion of reductions in the health care program for the poor and disabled called for in the House and Senate versions of the Obamacare repeal and replacement legislation. Deliberations on the new budget resolution until now have been overshadowed by the fight in the House and the Senate over health care reform and the hub-hub over congressional and federal investigations of the Trump administration. However, the spotlight will dramatically shift to the budget debate later this summer. The House and Senate must each pass a budget resolution and then reconcile their differences in a final document that will be used as a guide by the appropriators in passing a dozen major spending bills for the coming fiscal year. The new budget resolution will be doubly important this year because it will be used by the Republicans as the vehicle for pushing through major corporate and individual tax reform legislation under special reconciliation rules that will prevent the Democrats from filibustering the bill in the Senate. The minority Democrats will be powerless to prevent the Republicans from using budget reconciliation to pass major tax cuts later this year – assuming, of course, the House and Senate and the Trump administration can agree on a spending blueprint for the coming year. However, Republicans will have no choice but to negotiate with the Democrats later this fall over individual spending bills to keep the government operating or to pass legislation raising the debt ceiling. That means Senate Minority Leader Chuck Schumer of New York, House Minority Leader Nancy Pelosi of California and other leading Democrats will have considerable leverage in negotiating the final terms of fiscal 2018 spending policy. But for now, the Democrats are on the outside looking in. “Democrats believe we can strongly support both our national and economic security, and we will fight against Republican attempts to pit them against each other,” Yarmuth added. One major hurdle facing the Republicans in bolstering defense is winning support to breach the spending caps established by the 2011 Budget Control Act to reduce the deficit. McCain, Thornberry and other defense hawks want to lift the cap for defense, as Trump has requested. However, some conservatives are just as concerned about containing the deficit as adding to the Pentagon’s already massive budget. What’s more, many Democrats say they won’t go along with raising the cap on defense spending unless the domestic spending cap is lifted as well. 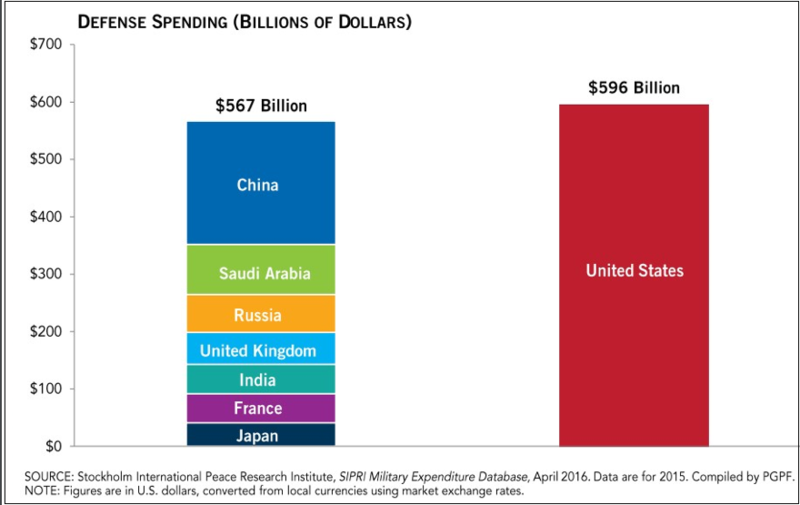 Yet critics insist the military is awash in funds even as it has been greatly downsized since the height of the wars in Afghanistan and Iraq wars and has done little to control spending and avoid cost overruns and waste. Gordon Adams, a defense policy expert and historian, has voiced concern that Republicans on Capitol Hill and the Trump administration are pressing for a major boost in defense spending without any serious public debate over whether that spending is necessary.